“What's the best flour for sourdough?” asks Marie. Marie also adds a few qualifications: it can't be wheat, it has to be versatile and healthy, it should be as low starch and low glycemic as possible, and it should be frugal. But we're tackling it anyway on this week's #AskWardee. The Question: What's The Most Versatile, Most Frugal, Healthiest Flour For Sourdough? I am really confused and unsure which flour is best for me to make sourdough bread with. Amaranth, buckwheat, rye, teff, millet, quinoa, or can I use something like chickpea or flaxseed or brown rice? I have PCOS and need to watch my carbs and gluten. However, I am interested in making sourdough for my husband, and I want to occasionally enjoy a slice for myself, too. Just because the bread is mostly for him doesn't mean I don't want it as healthy as possible for him and me. I know you use einkorn for your family. It's tempting to just go with that because I know I could just follow your recipes to a T. Do you perhaps know what flour would be best for us under the terms I provided? Thank you so much for your time. It is greatly appreciated. I am getting so spun around the more I read! Marie, that's a tough list of qualifications — not all of which go together that well. Mainly because the healthier and more off the beaten path you get, the more expensive you get, too. Still… I think we'll come up with something for you. First, let's discuss your options. Any flour with starch is going to be suitable for a sourdough starter. Because starch is the sugar, and that's the food the starter needs. Starters with gluten-free flours (like the ones you mentioned — amaranth, buckwheat, teff, millet, quinoa, brown rice, plus oats and others) often need help — it's called a boosted starter. Where you add water kefir or Kombucha to them regularly to make them more bubbly and strong. There's more info on that in this #AskWardee 009 — Gluten-Free Sourdough Starter Basics. Starters with glutenous flours (wheat, rye, spelt, einkorn) tend to make more bubbly, active starters and don't need a boost. So, here… you could go with any of these. Non-wheat, of course. The gluten flours are going to be the most versatile in baking. If you take out the modern wheat, the next most versatile are spelt and einkorn (my favorites). They both make light baked goods and great breads. They don't need to be mixed with other flours for your baked goods to turn out great (with a little bit of practice, of course). Einkorn is a 5,000 year old variety of wheat that many find easier to digest than modern wheat (it has gentler gluten and less and gentler starch). Yet it's a bit tricky to figure out how to use because it behaves differently. You can skip the learning curve by using my free & AMAZING no-knead einkorn bread recipe! Rye is not my favorite. It is hard to get right and turns out very dense unless blended with other flours. The gluten-free flours work best if 4 to 5 of them are blended together and used in pastry baking — quick breads, muffins, cakes, cookies. They really, really need help with binding because they lack gluten. So eggs or chia seeds or flax seeds are really important to prevent a crumbly result. They can make sourdough sandwich bread, too, but it's usually not like making it with the gluten flours — just sayin'. There's more info in my Allergy-Free Cooking eBook & Video Package. I just answered this in the previous qualification so I won't repeat myself. All the flours you're mentioning are more expensive than wheat, though you may find good deals with a bit of shopping around. Of the gluten flours that are still in the running — einkorn is more expensive than spelt, though I often see comparable prices here and there. If you're a member of Traditional Cooking School or purchase the Einkorn Baking eBook & Video Package, you can save on those flours or grains through specials we've negotiated for you. My no-knead einkorn sourdough bread needs about 1-1/2 pounds of flour, making the flour cost for the loaf $4.50 (at the price above, not counting any member discounts). Yes, it's more than grocery store bread, but that's an apples to oranges comparison given that store bread is so much less healthy than true homemade sourdough bread. The right comparison is to an artisan bakery price — which could be $5 to $8 or more per loaf. Rye, though it's harder to work with in breads and such, may be an option for feeding your starter since it is usually cheaper than spelt or einkorn. I haven't priced out the gluten-free flours. If you're purchasing a pre-mixed blend, you're likely to get more starch and pay a premium. You can mix your own at home. The price will depend on which 4 to 5 you choose — and the price might end up being comparable to spelt or einkorn anyway. Ok, so first we need to talk about the fact that all these grains (both gluten and gluten-free) have carbs. It's in the form of starch. Since you have PCOS, the very best thing you can do (provided you can eat some starch) is to prepare all your grain-containing baked goods with sourdough — because the organisms in the starter eat the starch and reduce it. The more starch they consume, the lower the glycemic index (which is a ranking scale of how much sugar/starch affects blood-sugar levels). Based on the research I have seen, regular non-sourdough white bread has a glycemic index of 71 (that’s High GI), while sourdough bread has a glycemic index of 53 (that’s Low GI). This means sourdough is a very effective method for lowering the glycemic index of the bread! Yet, how does sourdough lower the glycemic index? The bacteria and yeast consume the starches and sugars in the flour, so it has less starch when you eat it. Also, I saw research that suggested that the beneficial acids in sourdough (produced by the beneficial organisms in the starter) can help with blood sugar and digestion, too. Just because sourdough bread is considered a low GI food does not mean one should eat to excess. A lot of bread is still a lot of bread. One slice is still one serving of grains. If you’re managing diabetes or blood sugar, you can (and should) decide what’s allowable for you. And like with anything health-related, do your own research, pay attention to your body’s responses, and proceed with caution. One size does not necessarily fit all. I would suggest also looking into ancient grains like einkorn. Einkorn has 1/2 the amount of starch as modern wheat. Combined with sourdough, I speculate your bread will be even lower than a GI of 53. (Though I don’t have proof of this… it’s just logical. )” —#AskWardee 035 Is Sourdough Bread Low-Glycemic? As for gluten-free flours, I suspect they're all similar — they will be high glycemic in un-soured bread. Which means in sourdough bread, you'll have some reduction of starch but not all. Also… keep in mind that commercial pre-mixed gluten-free blends contain high amounts of pure starch disguised as flours — potato and tapioca lead the bunch. These are super high on the glycemic index, higher than wheat even. And will still be so in sourdough bread, I think. With all this mind, and knowing that I don't have a definitive answer (who does the research on this stuff??? 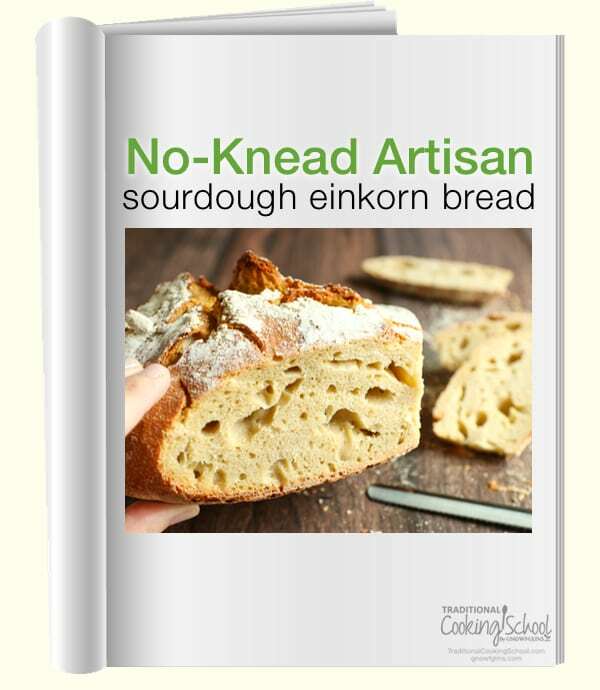 ), my safest conclusion for you is to use einkorn with sourdough. When and if you eat these types of foods, that is. If you're already avoiding modern wheat, that's half the battle. Modern wheat has been hybridized (selectively bred) to produce high-gluten and high-yield plants. Many researchers have linked it to modern diseases. Einkorn, on the other hand, is the oldest wheat variety we know (5,000 years old). It has less starch and gentler forms of it, as well as a gentler form of gluten. The other gluten-containing ancient grains — emmer, spelt, kamut — were all derived from einkorn. They are arguably healthier than modern wheat, yet still not the original form. What about the gluten-free grains? If they are whole grains (not starches like potato and tapioca), I have heard nothing against their nutrition, provided you can eat them. No matter what… select organic grains if you can. Perhaps locally from a farmer you trust. Or sourced from a small farm that others recommend or which has a good organic reputation. If you avoid modern wheat and the gluten-free pure starches, I think you'll find nutritious options. Gluten-free flours — any of them, really — except the pure starch ones, and always blend 4 to 5 of them together for best results PLUS consider using a boosted starter (again see #AskWardee 009). Now, price shop around those… to come up with what works best for you and your family. #AskWardee 035 Is Sourdough Bread Low-Glycemic? Gluten Intolerance and Sourdough: Is Sourdough Gluten-Free? What are your favorite flours for sourdough and why? 1. How much of the “mother culture” do you discard every time before re-feeding to keep it healthy? 2. What does your dough consistency need to be when preparing the dough for baking? I didn’t remove any of the mother culture when I did the feeding on the 2nd day and found that it wasn’t as bubbly (Happy) as before when I brought the culture home. So I think what I am asking is how much of the mother must remain in your jar everyday before feeding? I have made 2 loaves so far, the first one had the typical sourdough texture but didn’t rise ( I think my mixture was to wet). The 2nd loaf I added more flour, kneaded the dough, let it rise then baked it. This had a great rise to it but was dense like a bought white bread loaf, didn’t have the typical sourdough texture. We discard half of the starter when feeding a new starter. This helps build a strong, healthy starter. The dough consistency varies depending on the recipe you are using. A no-knead dough will look quite shaggy while a kneaded dough will be smooth and elastic. You’ll want to refer to your recipe for more information and details. You’ll want a more mature starter (about 3 weeks old at least) for bread making. The more mature starter will give you the rise you need to make a lovely loaf. Your younger starter is perfect for things like pancakes, waffles, cracker, etc when it is about a week old. You do not mention emmer. Is it too soft(no gluten)? It is more ancient than spelt. And Blue Bird Grain Farms sells fabulous Emmer, Dark northern rye and I think they have started to sell Einkorn as well. I have used their flours and they are wonderful. Just followed the recipe for Rye bread ? n the Einkorn cookbook. It’s great. I have not yet converted to using Einkorn flour. I use organic unbleached wheat flour. I have the recipe for teh no-knead sourdough einkorn artisan bread and I want to make the recipe. However, I know einkorn responds to water differently. Do I need to adjust the amount of water I add if I am using regular wheat flour. I have the sourdough ecourse book and that no-knead recipe is for the bucket method. I don’t want to use this method. Thanks in advance for helping me to clarify my confusion. What would be the nutritional differences in (grain) sourdough if you were to just use white flour (endosperm, not whole grain)? Benefits vs cost? This is beyond our expertise because we don’t bake with white flour and haven’t looked into it. Sorry! My original sourdough starter was based on white unbleached flour. I”ve been trying to switch it over to organic spelt .Firstly full on then just half and half then just a quarter spelt but each time there was no life. I then went back to feeding with the white flour only and surely enough bubbles and a full rise. My dilemma is I don”t want to use white. Thoughts anyone ! “Split in half. Feed one bowl regularly with AP. Feed the other with spelt and give it time to adjust. FYI: Spelt is NOT gluten-free. I have just recently attempted making 100% whole wheat sourdough using an ancient grain I sourced from a local village. The bread is alright but has a very dense texture and no air pockets in it. I kneaded the dough for 20 minutes (by hand) and it had a rise period of around 8 hours. I don’t know what is wrong, does the flour I am using have a very low gluten content because it is ancient? Also, what are some tips you have for baking with 100% whole wheat? Do you have any suggestions for what type of whole wheat and or good brands? You didn’t mention which ancient grain you’re currently using. Wardee likes Einkorn and spelt.